Rich, well drained soil generously amended with compost. In clay soil, use raised beds. Feed every 3 weeks with a liquid organic fertilizer, and use a rich, biodegradable mulch such as grass clippings. Start seeds indoors, or sow in shallow furrows filled with potting soil. Thin seedlings to 12 inches apart when they are 3 weeks old. Chop the pulled seedlings into salads. When the bulb is the size of an egg, surround it with 6 inches of loose mulch to help it plump up. Snip tender young leaves as needed in the kitchen. When the bulbs reach 3 inches in diameter, pull them and store in the refrigerator. Grows best in cool weather. 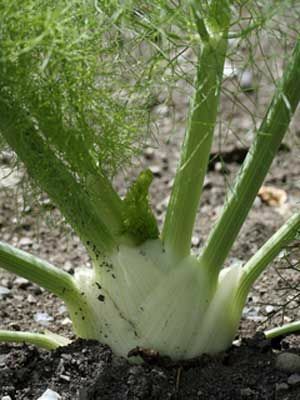 In some climates, fennel grows better in fall than in spring.